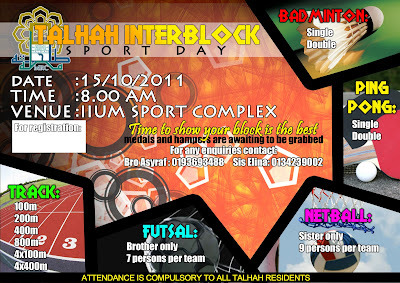 Attention to all Mahallat Talhah and Tabari residents, you are cordially invited to Talhah Interblock Sports Day (TAIBS) on this Saturday 15th October 2011. First place winners will receive medals while all participants (block) will get hampers. So come and join TAIBS at IIUM Kuantan's Sport Complex from 8am-2pm! p/s: Booths selling food and beverages will be opened.